PSNews – Major Nguyen Viet Hung of the Quang Xuong District Police Station in Thanh Hoa Province was praised by the people as he voluntarily donated his rare B-type blood to save a patient in a serious condition. PSNews - The member units of Emulation Grouping 4 under the Ministry of Public Security (MPS) on March 11 held a ceremony in Ninh Binh Province to sign the mutual emulation agreement "For National Security" in 2019. PSNews - A delegation of the Ministry of Public Security (MPS) led by Senior Lieutenant General Bui Van Nam, Deputy Minister of Public Security and Head of the Steering Board for Ensuring Public Security and Order for celebrations of the UN Day of Vesak 2019 in Vietnam, on March 11 made a field trip to Tam Chuc Buddhist Culture Center in Kim Bang District, Ha Nam Province, and checked security work for the event in the locality. PSNews – The Inspection Committee of the Public Security Central Party Committee and Ministry of Public Security in March organized a scientific conference themed "Improving the efficiency and quality of work of grasping situations of local-level units" in Party inspection, supervision and discipline enforcement in the Central Public Security Party Committee. PSNews – The Southwest Mobile Police Regiment on March 8th held a ceremony to kick off its training program in 2019. After the event, the member units of Emulation Grouping 8 under the High Command of Mobile Police also signed the mutual emulation agreement “For National Security” in 2019. PSNews – Lieutenant General Nguyen Van Son, Deputy Minister of Public Security on March 8th visited and worked with police units in central region to rearrange the police units’ working premises according to their new organizational apparatus. PSNews - The Investigation Police Department on Drug-related Crimes on March 9 in collaboration with the Binh Duong Provincial People Committee and Police Department launched a campaign aiming at raising the public awareness of drug harms. PSNews – The Traffic Police Division under the Hanoi Municipal Police Department on March 6 launched a campaign to deal strictly with violations of traffic safety regulations, particularly helmet wearing regulation while riding motorbikes. PSNews - The Tay Ninh Provincial Police Department on March 7 held a meeting to mark the 109 anniversary of the International Women's Day (March 3rd) and to honor excellent local policewomen. PSNews - The Youth Union Chapter of Traffic Police Team No.1 under the Hanoi Traffic Police on Wednesday in collaboration with the Management Board of Hoan Kiem (Sword) Lake organized an outdoor activity cleaning up the surrounding area and disseminate people about environment protection. PSNews – The Can Tho Municipal Police Department in collaboration with the city’s Military Command on March 7 held a conference to review results of the cooperation between the two forces in line with Decree 77 of the Government. PSNews – Major General Truong Van Thong, Director of the Foreign Affairs Department under the Ministry of Public Security (MPS), on March 7 received Ms. Catherine Wong Siow Ping, Ambassador Extraordinary and Plenipotentiary of the Republic of Singapore in Vietnam. 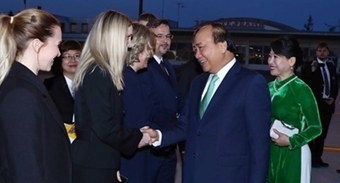 PSNews - The Traffic Police Department organized a conference on March 7 in Bac Ninh to review the work of ensuring traffic order and safety for the second U.S. – DPRK (Democratic People’s Republic of Korea) Summit. PSNews - The Women Union chapter of the Department of Internal Political Security on March 5th in collaboration with its Youth Union chapter held a charity event at K Hospital 3 (Tan Trieu, Hanoi) to present gifts to needy women patients. PSNews - The Youth Union organization of the Public Security Forces on March 5 held a ceremony to launch the Month of Youth 2019. The Ministry of Public Security (MPS) held a conference on March 5 to review the work of ensuring security for the second U.S. – DPRK (Democratic People’s Republic of Korea) Summit, and the DPRK Chairman Kim Jong-un’s official visit to Vietnam. PSNews - The Ministry of Public Security (MPS) held a conference on March 5 to review the coordination with the press authorities and press agencies in 2018 and agreed on new working plans for 2019. PSNews - During the second US-DPRK Summit in Hanoi, the traffic police force has used a large number of big motorcycles, including Yamaha FJR1300P and Honda NC750X to guide the traffic and protect participating delegations.